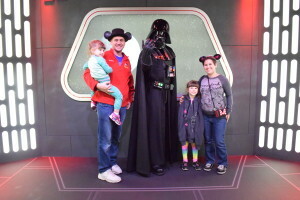 My family and I visited Disneyland a couple of weeks ago and we were very excited to experience the much anticipated Star Wars Season of The Force. One of the amazing new Star Wars “must do’s” for Chase Disney Visa Cardmembers is the Imperial Meet ‘N’ Greet. While other Disneyland visitors have to wait in long lines to meet Darth Vader, Chase Disney Visa Cardmembers hardly have to wait at all. It’s like having a FastPass to the Dark Side! By simply flashing my Disney Visa Card to the Cast Member at the desk inside of the Star Wars Launch Bay in Tomorrowland, we were escorted to a private Cardmember location. 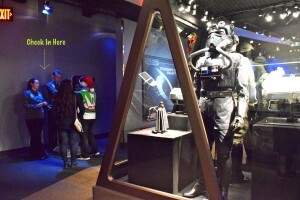 The check in desk is located to the left of the tie fighter pilot suit as pictured. The Imperial Meet ‘N’ Greet is offered daily from 4:00 to 8:00pm. It was a very crowded Friday at Disneyland and I wasn’t sure how long the line would be, so I decided to go right at 4:00pm. Much to my surprise and delight, there was absolutely no line, so we didn’t have to wait at all! I asked the photographer if she could also take a picture with my camera afterwards. She pointed to the side and said it was up to him. What was probably a 6’5” Darth Vader came out of the shadows and ordered us in his deep commanding voice to follow him inside a room to take a picture with him. I have to admit, he was pretty intimidating! If you have young children, they might be frightened. 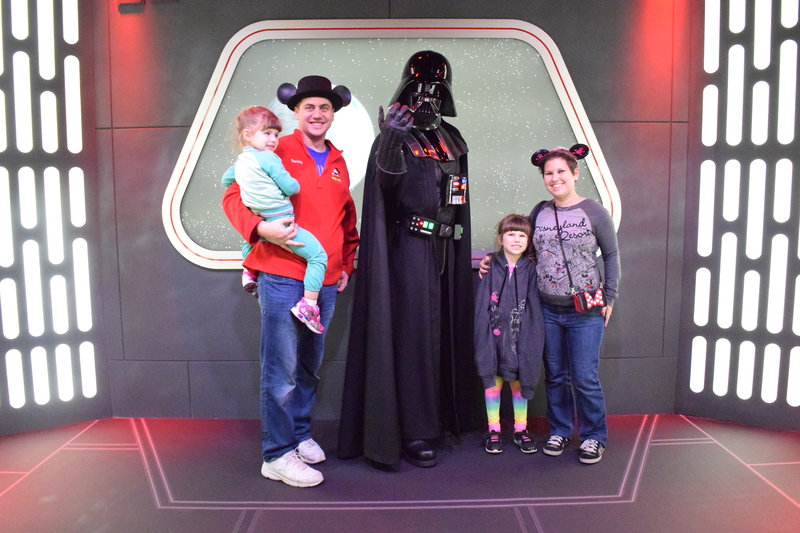 Darth Vader tried to engage my daughters (Ages 6 and 3) and get them to join the Dark Side, but both of my kids were so intimidated, they couldn’t even respond. We then posed for a picture with the Supreme Commander of Imperial Forces, first with the photographer’s camera and then with my camera. (Thanks, Vader!) The photographer gave us a Photo Pass and told us to pick up our free 5” x 7” photo at the Main Street Photo Supply Co., which we did later that day. DIVA TIP: Don’t wait until Disneyland is almost closed to pick up your photo. That is when they are the busiest and the line is enormous! The Imperial Meet ‘N’ Greet is just one of the benefits for Disney Visa Cardmembers and Star Wars fans. Chase now offers three double-sided Star Wars designs on their Visa cards: Darth Vader, Yoda, and R2-D2 with C3-PO, so you can show your love for Star Wars everywhere you shop. 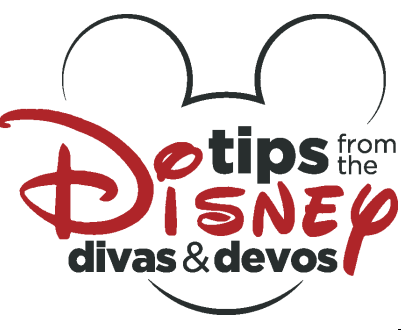 When you use the Disney Visa Card, you can also save 10% on purchases of $50 or more made at the Disneyland Resort, which let’s face it, is pretty easy to do. This includes high end purchases made inside of the Star Wars Launch Bay Store. One of the purchases my diehard Star Wars fan of a husband made there was an imperial lightsaber umbrella that sells for $64.95. (Rebellion lightsaber umbrellas are also sold, but apparently, Darth Vader was successful in recruiting my husband to the Dark Side.) Like many of the Star Wars merchandise inside the store, the umbrella is exclusively sold there and flies off of the shelves. DIVA TIP: Since people may understandably be apprehensive about leaving their expensive galactic purchase in their stroller when they go on rides, Cast Members will hold your purchase for you at the store until it closes at 8:00pm. If you haven’t picked your purchase up by then, it will then be held for you at The Star Trader, the store located at the exit of Star Tours. To feel the force for yourself and give your family a magical out of this world experience, you can sign up for a Chase Disney Rewards Visa Card here.